H O W I T H IN K I C AN H E L P YO U H O W I T H IN K I C AN H E L P YO U 1 .
p o s e 2 .
t a g s 3 .
t a g s 4 . R e t a r g e t in g " O p t im iz a t ion "
h a p p e n "
c h a n g e s ? c u s t o m e r s ? t h e m ? 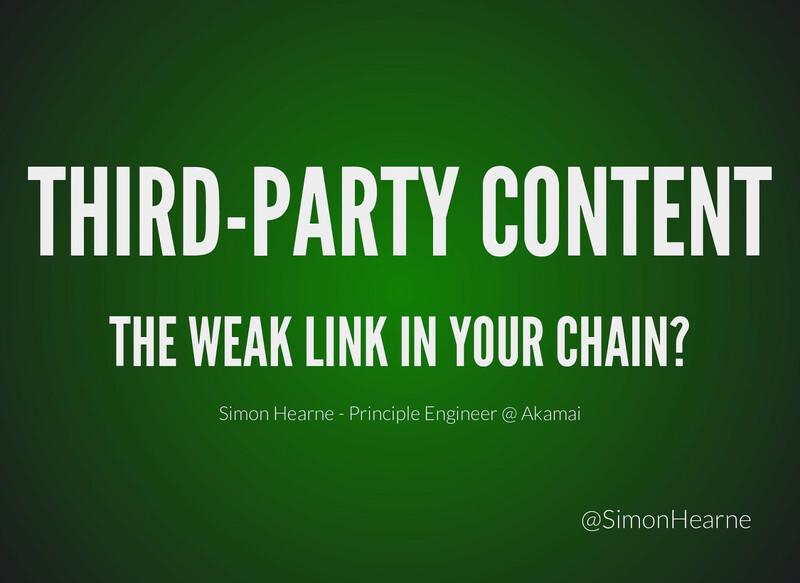 View Third-party content: the weak link in the chain on Notist. Third-party content is the thorn in the side of many a good website. From A/B testing that delays render to advertising networks that bleed user data, we depend on services over which we have no control. In an ideal world we could attribute a user experience cost to each third-party provider, allowing marketing, eCommerce and business intelligence to make educated decisions about which providers should stay and which should go. Will moving to a new advertising network increase ad revenue? Is A/B testing losing more revenue that it gains? Does measuring web performance impact web performance? Data for this talk has been gathered from over 500,000 websites, with detailed investigation performed on millions of pageviews from a small number of sites. You will leave this talk armed with the tools and knowledge to measure the performance of third-party providers and provide compelling arguments for whether they should stay or go.